Ever read a book that you've heard such positive praise for, yet when you begin reading you can't seem to see why? And with that same book, you tell yourself to keep reading but think it won't get any better only to find that you were completely and utterly wrong? I'd like to thank the publisher for supplying me with a copy of this book for and unbiased review. Description: For Mab Prowd, the practice of blood magic is as natural as breathing. It's all she's ever known. Growing up on an isolated farm in Kansas with other practitioners may have kept her from making friends her own age, but it has also given her a sense of purpose—she's connected to the land and protective of the magic. And she is able to practice it proudly and happily out in the open with only the crows as her companions. Mab will do anything to keep the ancient practice alive and guard its secrets. But one morning while she is working out a particularly tricky spell she encounters Will, a local boy who is trying to exorcise some mundane personal demons. He experiences Mab's magic in a way his mind cannot comprehend and is all too happy to end their chance meeting. But secrets that were kept from Mab by the earlier generations of blood magicians have come home to roost. And she and Will are drawn back together, time again by this dangerous force looking to break free from the earth and reclaim its own dark power. COVETED! A MUST HAVE READ! My splats: Poetically haunting, gorgeous prose, and unseen magic in the natural world provide a fantastic sequel to Book I, BLOOD MAGIC. From my opening statement, you can probably conclude the direction my opinion of this book will go. It. Was. Awesome. And for many reasons. At the onset, Mab seemed torn, struggling to figure out herself, her family, and her purpose in life. The difference from this natural teenage mental battle was Mab's real struggle revolved around strange roses that could not be destroyed. First impression of Mab was creepy, which I personally liked. The scene permeated in eerie fog, but teased my curiosity to continue reading. She was just plain interesting, strange, and different. And although the story's beginnings were slow - at least for me, I soon recognized the need for such a start. Gratton had to give the reader a large amount of information in order to properly set up the story. As facts fed me, a picture of nature's invisible mist and magic blotted to the surface, posing questions of nature itself and what might truly be there that we ignore everyday. It wasn't long before I honestly couldn't put the book down. This tale was superbly written. A story within a story, love story within a love story, and a mystery within a mystery purposely mingled throughout the pages to bring the past to the present and the future to new possibilities. Elements were strategically revealed through three POV characters, who gave interesting views of nature's magic and the world it creates. Mab and Will shared their world of the present, while a mysterious third party unearthed the past and history of the land Mab lived on. I got a completely different feel for the story, depending on which point-of view I was seeing through - Mab or Will's. Mab covered the odd and almost ominous sense and subjects, while Will felt easy, average, and normal. Opposites attract, right? 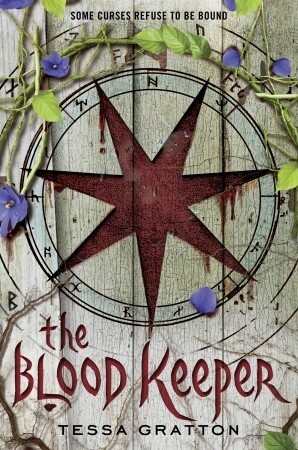 And in closing: after reading The Blood Keeper and discovering it was book II in a series, I went out and bought book I, BLOOD MAGIC. I did not regret that purchase. I'd recommend this book to any YA lover, paranormal/fantasy/romance/mystery fanatic, nature enthusiast and examiner of all things natural, and teens and adults alike. Have you ever read (or do you know) anything about blood magic? Great review, Sheri! While it's not something my boys would be interested in, maybe my daughter will enjoy it in a few years (she's not at this reading level yet). Well I think I'm going to have to read this after a review like that. I'll check it out. Blood magic is popular in dungeons and dragons. In Dragon Age the video game there are blood mages. I need an unputdownable book. Looks good!! I think you'll be happy with this one, Johanna. Sounds awesome. I'll have to grab a copy. Thanks so much for stopping by and reading! If you do purchase a copy, I think you'll love it. TBR list. I haven't read the first one, but have a funny feeling I'd love it. It's rare you stumble across a truly unique protagonist. I agree. Mab is so unique. As a matter of fact, I had a hard time figuring anything out about her at first that I could hold onto. But that eventually faded.